Pour melted butter into 9″ pie plate or deep cake pan, make sure it entirely covers the bottom of the pan and use a spoon or spatula to grease the sides of the pan. Sprinkle brown sugar evenly over butter mixture. Arrange pineapple slices over the bottom of the pan, slice leftover slices in half and arrange up the sides of the pan, as seen in photo. Place cherries in center of pineapple rings and as desired in empty spaces. Set aside. To prepare vanilla cake, beat butter and sugar in medium-sized bowl until creamy and well-combined. Add eggs, beating one at a time until combined. Alternate adding flour and milk to the wet ingredients, starting and ending with flour and mixing until just combined after each addition (I prefer to do this part by hand with a spatula to be sure not to overmix). Pour batter evenly over prepared cake pan and pineapple/cherry layer. Bake on 350F for 30 minutes. At the 30 minute mark, loosely cover with foil and continue to bake (still on 350F/175C) for another 15 minutes, until a toothpick inserted in the center comes out mostly clean with few crumbs (total cook time for cake will be 45 minutes). Allow to cool for 10-15 minutes and then carefully invert cake onto serving platter (careful, it will still be very hot!). Allow to cool before cutting and enjoying, but don’t wait too long as this cake tastes wonderful (best!) warm from the oven! 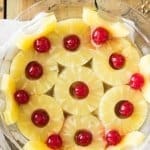 How Do I Flip a Pineapple Upside-down Cake? 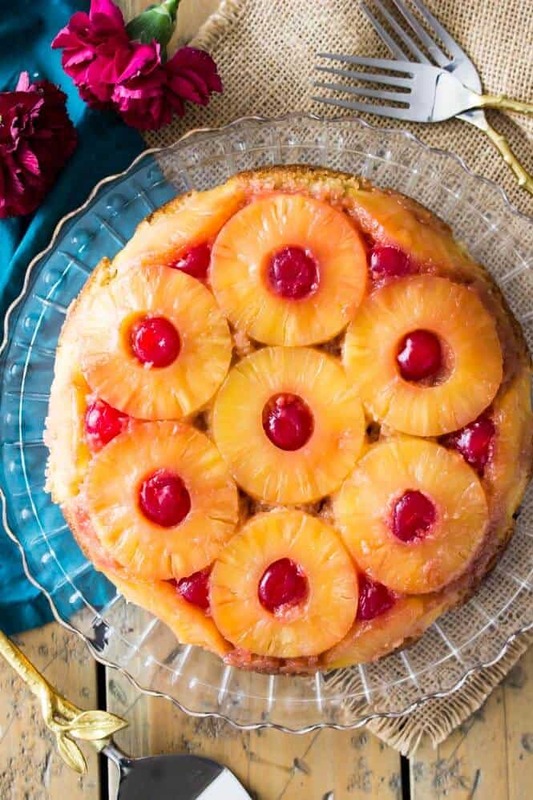 Allow your pineapple upside-down cake to cool for 10-15 minutes before you attempt inversion. If any of the cake has baked into the edge of your pie plate or cake pan, you can use a knife to gently loosen the edges and free them from the pan. Place your cake platter (or any plate that’s larger than your pineapple upside-down cake) over the pan — plate surface should be facing your vanilla cake layer. Using oven mitts carefully and firmly grip both the side of the cake platter and the cake pan on either side. And that is it! This cake tastes best warm, so while you still want it to cool a bit, I don’t recommend waiting too long to dig in! This entry was posted in Recipes and tagged cake on March 17, 2019 by The Yellow Pine Times.